Kerala, the most beautiful state in the southern tip of Indian Peninsula is popularly known as "The Gods Own Country". It has breathtakingly beautiful Valleys, Mountains, Rivers, Backwaters, Long coast, clean Beaches, variety of art forms, temples and traditional medicine "Ayurveda". Kerala was listed amoung 'Ten Paradises of world' by National Geographic Travel magazine. Kerala arts and crafts are famous all over the world. When you are on a visit to any of the temples in Kerala, what might strike you the most is the elegancy of artistic design work of the Temple idols, beautifully crafted lamps, huge bells, multi storied lamps etc on the temple compound. We usually never get a chance to know who makes these magnificent metal crafts. But we all know that making these crafts is an ancient art and tradition of Kerala. Craftsmen from Viswakarma community located in Payyanur, Thiruvananthapuram, Angadipram, Irinjalakkuda and Kozhikode makes these crafts. Payyanur is home to many craftsmen in Kerala and the idols made by these craftsmen can be seen in many temples in Kerala, Karnataka and Tamilnadu. Traditional craftsmen from a small village Padoli in Payyanur is well known for their artistic works and craft making skills. Some of their popular works are Dashavatharam Lamp, Ramayanam Lamp, Lakshmi Lamp, Saraswati Lamp, Krishna Lamp, Multi-layered Lamp (Deepasthampam), Hanging Lamp (Thookkuvelakku) and other decorative designs in Bell Metal. 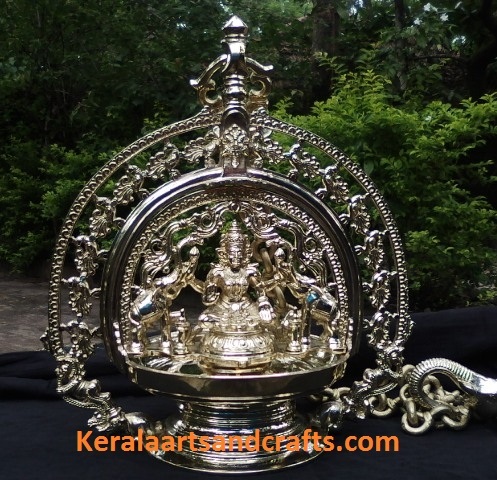 We welcome you to the world of Bell Metal crafting and introduce you the finest craftsmen from north Kerala, especially the craftsmen from Padoli, Payyanur.